Summer is well, and truly over, the kids are back at school, and I, for one, am more than ready to put away the grill, swap out the screens, and swing into autumn. Alas, the hot, muggy air is lingering, so although I am so ready to break out my sweaters, warm up the apple cider, and return to my weekly gi-normous pot of soup habit, it seems it will be a few more days or weeks until this is possible. I’m having to fall back on some of my hot weather recipes because I can’t face the idea of turning on the stove. I am seriously ready for soup, aren’t you? Corn chowder, particularly, has been on my mind. Partly because they are practically paying us to take it away from the farm stands, but also because it screams “autumn” to me in the way few other soups can (except pumpkin soup, but I am so done with pumpkin everything). I lay in my bed this morning thinking about how marvelous a massive vat of corn chowder topped with cooked shrimp and fresh cilantro would be. But then I ventured outside to get the mail and ugh…the air had taken on the consistency of corn chowder, and not in a good way. It was so humid I could hardly breathe. International Women’s Day was first celebrated in the United States in 1909 to honor the 1908 garment workers’ strike in New York City. Championed by the Socialist International, Women’s Day was established as an annual event the following year, though no fixed date was established for the actual day making it challenging to celebrate globally. But the dogged international women kept plugging away and the following year on March 19, 1911, the day was marked by protests, demonstrations, and rallies in Austria, Germany, Switzerland, and Denmark. The emphasis then was on women’s right to vote, right to work, to hold public office and calls for an end to economic discrimination on the job. Russians came to the party in 1913, using International Women’s Day to stage demonstrations not only in support of women’s rights but also in support of the demand for liberal reform in the autocratic Russian Empire. In 1914, calls for peace were added to the general agenda. What started out as a marvelously feminist holiday — arguably the midwife of the Russian Revolution — has somehow been parlayed into a one-way Valentine’s Day in Russia. If you are a woman, you’re meant not to take to the streets, but instead lounge around in your best lounging attire while the men do all the domestic housework. Including the cooking. These days food writers are being encouraged/ordered/compelled, not so much to dumb it down but to simplify the bejesus out of a recipe. And I get it — just as people eschewing car ownership for the convenience of UBER and Lyft, there is also a trend to streamline the process of food prep. I continue to be baffled by the growing popularity of the almost-kinda-sorta-ready-made meal kits such as Blue Apron, where they send you exactly the portions you need, down to the tablespoon soy sauce or the one clove of garlic. It’s insane! But okay, it’s simple. Russian men aren’t known for their prowess or proclivity in the kitchen (the grill is another matter entirely) so I did not need to be reminded by my editor to “keep it simple, please!” For these poor chaps, chained to the kitchen on that one day a year, I came up with this recipe, which I think is one of my true slam dunks. I used to be quite intimidated by shrimp, feeling that the only thing for them was to lay them out on a bed of ice and spike some cocktail sauce with Tequila (really, try it). But then my Russian in-laws came to stay and I served up a large seafood platter along these lines and…they didn’t touch it. I was somewhat baffled and not a little offended by this. I later learned that they were waiting for the shrimp to come to room temperature, since ice, as every Russian knows causes cancer. Yes, really. So, I’ve had to branch out. 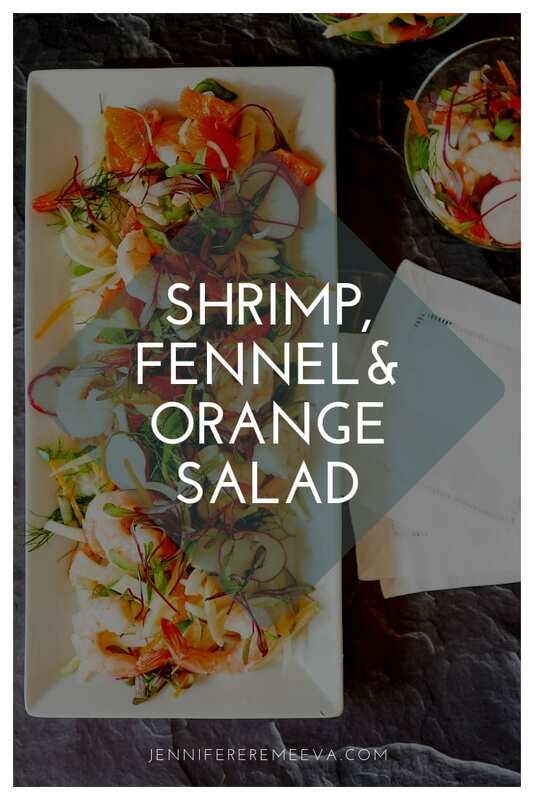 These days, I enjoy shrimp all kinds of ways, but this salad remains a firm favorite: the orange and fennel work very well together, nice tart foils to the shrimp’s pungunt flesh. A little crunch from the scallions and some flavor nuggets from the shoots, and in under 30 minutes, you have a salad that can work as a starter or main course. The only piece of vaguely complicated kitchen kit you need for this is a mandoline slicer, which I feel firmly no home should be without (my editor tells me I’m crazy, and I’m sure she’s right because she always is, but how else do you make a shaved salad?) Okay, in a pinch, a sharp knife will serve. I’m having Shrimp, Fennel, and Orange Salad for dinner tonight before I head to my air-conditioned bedroom and dream of frosty mornings and corn chowder for lunch. 1 lb of cooked shrimp peeled and deveined. Remove the zest from one orange and set it aside. Use a sharp knife to remove all of the white pith, then slice the orange into 2 cm chunks. Place these with the zest. Slice the remaining orange in half and place, flesh side down on a skillet placed over medium heat. Let cook until the orange begins to leech its liquid. Check that the flesh is now slightly charred. Set both halves aside. Use a mandoline (watch your fingers!) or a food processor fitted with a steel cutter, or a very sharp knife to slice the fennel and radishes as finely as you can. Toss the slices with one Tbl of Malden Salt and set aside. Just before you are ready to serve, squeeze the charred oranges into a small container. Add the salt and whisk to combine. Then slowly pour the olive oil into the mixture, whisking continuously. 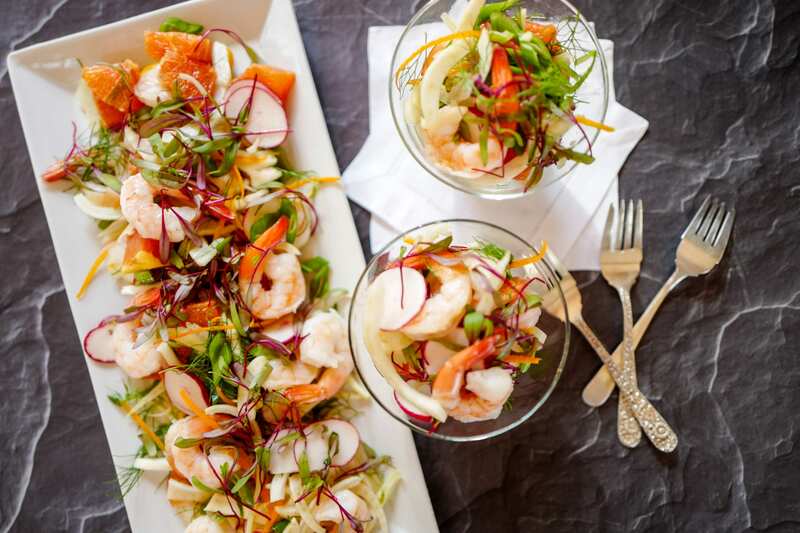 Toss the shaved fennel and radishes, orange slices and zest, and shrimp with three-quarters of the dressing. Taste and adjust seasoning with additional salt and pepper. If you want to add the chili pepper, this is the time. Toss again with the cilantro and mint. Garnish with sprouts or shoots and serve immediately. The only piece of vaguely complicated kitchen kit you need for this is a mandoline slicer. In a pinch, a sharp knife will do. This recipe first appeared in The Moscow Times on March 8, 2018 in a column I wrote called An #Instafab International Women’s Day, including recipes to make at home to celebrate the day.